Nodal is considered the key inducer of mesendoderm in vertebrate embryos and embryonic stem cells. Other TGF-beta-related signals, such as Vg1/Dvr1/Gdf3, have also been implicated in this process but their roles have been unclear or controversial. Here we report that zebrafish embryos without maternally provided vg1 fail to form endoderm and head and trunk mesoderm, and closely resemble nodal loss-of-function mutants. Although Nodal is processed and secreted without Vg1, it requires Vg1 for its endogenous activity. Conversely, Vg1 is unprocessed and resides in the endoplasmic reticulum without Nodal, and is only secreted, processed and active in the presence of Nodal. Co-expression of Nodal and Vg1 results in heterodimer formation and mesendoderm induction. Thus, mesendoderm induction relies on the combination of two TGF-beta-related signals: maternal and ubiquitous Vg1, and zygotic and localized Nodal. Modeling reveals that the pool of maternal Vg1 enables rapid signaling at low concentrations of zygotic Nodal. All animals begin life as just one cell – a fertilized egg. In order to make a recognizable adult, each embryo needs to make the three types of tissue that will eventually form all of the organs: endoderm, which will form the internal organs; mesoderm, which will form the muscle and bones; and ectoderm, which will generate the skin and nervous system. All vertebrates – animals with backbones like fish and humans – use the so-called Nodal signaling pathway to make the endoderm and mesoderm. Nodal is a signaling molecule that binds to receptors on the surface of cells. If Nodal binds to a receptor on a cell, it instructs that cell to become endoderm or mesoderm. As such, Nodal is critical for vertebrate life. However, there has been a 30-year debate in the field of developmental biology about whether a protein called Vg1, which has a similar molecular structure as Nodal, plays a role in the early development of vertebrates. Zebrafish are often used to study animal development, and Montague and Schier decided to test whether these fish need the gene for Vg1 (also known as Gdf3) by deleting it using a genome editing technique called CRISPR/Cas9. It turns out that female zebrafish can survive without this gene. Yet, when the offspring of these females do not inherit the instructions to make Vg1 from their mothers, they fail to form the endoderm and mesoderm. This means that the embryos do not have hearts, blood or other internal organs, and they die within three days. Two other groups of researchers have independently reported similar results. The findings reveal that Vg1 is critical for the Nodal signaling pathway to work in zebrafish. Montague and Schier then showed that, in this pathway, Nodal does not activate its receptors on its own. Instead, Nodal must interact with Vg1, and it is this Nodal-Vg1 complex that activates receptors, and instructs cells to become endoderm and mesoderm. Scientists currently use the Nodal signaling pathway to induce human embryonic stem cells growing in the laboratory to become mesoderm and endoderm. As such, these new findings could ultimately help researchers to grow tissues and organs for human patients. The induction of mesoderm and endoderm (mesendoderm) during embryogenesis and embryonic stem cell differentiation generates the precursors of the heart, liver, gut, pancreas, kidney and other internal organs. Nodal, a ligand in the TGF-beta protein family, is the key inducer of vertebrate mesendoderm (Schier and Shen, 2000; Schier, 2009; Shen, 2007), ranging from zebrafish and mouse embryos to human embryonic stem cells. Nodal mutants fail to form mesendodermal cell lineages in zebrafish and mouse (Conlon et al., 1991; 1994; Feldman et al., 1998; Zhou et al., 1993), and activation of the Nodal signaling pathway drives the in vitro differentiation of embryonic stem cells into mesendodermal progenitors (Brandenberger et al., 2004; Camus et al., 2006; D'Amour et al., 2005; Hoveizi et al., 2014; Kubo et al., 2004; Parisi et al., 2003; Schier and Shen, 2000; Shen, 2007; Smith et al., 2008; Takenaga et al., 2007; Vallier et al., 2004; Yasunaga et al., 2005). Following its role in mesendoderm induction, Nodal activity also patterns the left-right axis. Nodal ligands are expressed in the left lateral plate mesoderm (Collignon et al., 1996; Levin et al., 1995; Long et al., 2003; Lowe et al., 1996; Pagán-Westphal and Tabin, 1998), and mutants that lack left-sided Nodal signaling exhibit multiple left-right defects (Brennan et al., 2002; Kumar et al., 2008; Long et al., 2003; Noël et al., 2013; Saijoh et al., 2003; Yan et al., 1999). Nodal is not the only TGF-beta-related signal implicated in mesendoderm induction and left-right patterning. Members of the Vg1/GDF1/GDF3 TGF-beta subfamily have been assigned various roles in these processes, although there are puzzling contradictions from the level of gene expression to the loss-of-function and gain-of-function phenotypes. The role of GDF1 in left-right patterning is well established. Gdf1 mutant mice exhibit left-right asymmetry defects (Rankin et al., 2000) and morpholino studies indicate that zebrafish vg1 (dvr1/gdf3) is required for left-right patterning (Peterson et al., 2013). GDF1/Vg1 alone is unable to activate the Nodal signaling pathway, but it increases the activity and range of mouse and zebrafish Nodal ligands in Xenopus assays (Peterson et al., 2013; Tanaka et al., 2007) and the activity of mouse Nodal in tissue culture cells (Andersson et al., 2007; Fuerer et al., 2014). Thus, Nodal and Vg1/GDF1 family members cooperate to pattern the left-right axis. The role of the Vg1/GDF1/GDF3 TGF-beta subfamily in mesendoderm formation is less clear. In Xenopus – where Vg1 was first discovered – vg1 mRNA is localized to a vegetal crescent in the oocyte and in the vegetal hemisphere of the early embryo (Rebagliati et al., 1985; Weeks and Melton, 1987). By contrast, zebrafish vg1 mRNA is localized to the animal pole of late stage oocytes (Marlow and Mullins, 2008), and it is present ubiquitously in the early embryo (Dohrmann et al., 1996; Helde and Grunwald, 1993; Peterson et al., 2013). Gdf1 and Gdf3, which are considered to be the mammalian Vg1 orthologs (Andersson et al., 2007; Chen et al., 2006; Rankin et al., 2000; Wall et al., 2000), are expressed in the 16-cell morula (Gdf3) and epiblast prior to gastrulation (Gdf3 and Gdf1) (Chen et al., 2006; Wall et al., 2000). Some Gdf3 mutants lack a subset of endodermal and mesodermal markers, while others grow to fertile adults (Andersson et al., 2007; Chen et al., 2006); conversely Gdf1 mutants only exhibit left-right asymmetry defects (Rankin et al., 2000). Some Gdf1;Gdf3 double mutants exhibit more severe defects in endoderm and mesoderm formation than Gdf3 single mutants (Andersson et al., 2007), and Gdf1-/-;Nodal+/-mutants resemble hypomorphic nodal mutants (Andersson et al., 2006; Lowe et al., 2001), suggesting some synergy between GDF1 and Nodal functions. Experiments in the chick and mouse indicate that Vg1/GDF1/GDF3 may act upstream of Nodal (Andersson et al., 2007; Chen et al., 2006; Rankin et al., 2000; Shah et al., 1997; Skromne and Stern, 2001; Tanaka et al., 2007). Thus, these analyses suggest that mouse Nodal, GDF1 and GDF3 may cooperate during early amniote development, but their regulatory and molecular relationships have remained unclear. Morphant studies in zebrafish suggest a function for Vg1 in left-right axis formation but not in mesendoderm induction (Peterson et al., 2013). Antisense oligonucleotide-mediated knockdown of Xenopus vg1 leads to defects in dorsal mesoderm induction (Birsoy et al., 2006), but most mesendodermal derivatives still form. Taken together, loss-of-function studies establish crucial roles for both Nodal and Vg1/GDF1 in left-right development and for Nodal in mesendoderm induction, but the roles of GDF1/GDF3/Vg1 in mesendoderm induction remain poorly understood. Another puzzling aspect of Vg1’s function is its apparent inability to be processed and secreted. This is in stark contrast to other members of the TGF-beta superfamily, which are generated as pro-proteins that dimerize and are cleaved to generate a secreted, mature dimer that binds receptors (Constam, 2014; Dutko and Mullins, 2011). Neither cleavage nor secretion of Vg1 has been detected in Xenopus and zebrafish, and correspondingly, overexpression does not yield a phenotype (Dale et al., 1993; Dale et al., 1989; Dohrmann et al., 1996; Tannahill and Melton, 1989; Thomsen and Melton, 1993). Conflicting results have been reported for GDF1 processing in heterologous systems, ranging from cleavage but inactivity in Xenopus oocytes (Tanaka et al., 2007) to no detectable cleavage in Xenopus embryos (Wall et al., 2000). Mouse Nodal-GDF1 heterodimers, but not zebrafish Nodal-Vg1 heterodimers, have been detected in a heterologous Xenopus system (Peterson et al., 2013; Tanaka et al., 2007). Upon fusion of the Vg1, GDF1 or GDF3 mature domain to the Activin or BMP prodomain, Vg1 is processed and induces mesoderm formation (Chen et al., 2006; Dale et al., 1993; Dohrmann et al., 1996; Kessler and Melton, 1995; Thomsen and Melton, 1993; Wall et al., 2000). However, it is unclear if these constructs reveal the true nature of Vg1, or whether the fused prodomains generate ectopic functions. Thus, it remains to be resolved how Vg1 processing, secretion, dimerization and activity are regulated. In this study we address the long-standing question of Vg1’s role in vertebrate mesendoderm induction and its relationship to Nodal, using zebrafish as a model system. Current models of zebrafish mesendoderm induction have focused entirely on the roles of the two zebrafish Nodal genes, cyclops (cyc) and squint (sqt), with no consideration of vg1 (Bodenstine et al., 2016; Cartwright et al., 2008; Chea et al., 2005; Constam, 2009; Hirokawa et al., 2006; Juan and Hamada, 2001; Liang and Rubinstein, 2003; Papanayotou and Collignon, 2014; Pauklin and Vallier, 2015; Quail et al., 2013; Robertson, 2014; Schier and Shen, 2000; Shen, 2007; Signore et al., 2016; Strizzi et al., 2012; 2009; Tian and Meng, 2006; Wang and Tsang, 2007; Whitman, 2001). cyc and sqt are zygotically-expressed at the embryonic margin and act as concentration-dependent inducers of mesendoderm (Schier, 2009). cyc;sqt double mutants (Feldman et al., 1998) and other zebrafish Nodal signaling mutants (Dubrulle et al., 2015; Gritsman et al., 1999) fail to form endoderm and head and trunk mesoderm. Conversely, ectopic expression of cyc or sqt induces mesendoderm formation (Bisgrove et al., 1999; Feldman et al., 1998; Gritsman et al., 1999; 2000; Meno et al., 1999; Sampath et al., 1998). These results, and the lack of a vg1 morphant mesendoderm phenotype (Peterson et al., 2013), have been interpreted to mean that Cyc and Sqt are the sole inducers of mesendoderm, without a requirement for Vg1 or other TGF-beta family members. Contrary to these models, we now report that vg1 is absolutely essential for mesendoderm induction. Vg1 is only secreted, processed and active in the presence of Nodal, while Nodal requires Vg1 for activity. Co-expression of Nodal and Vg1 results in heterodimer formation and mesendoderm induction. To determine the function of zebrafish Vg1, we generated vg1 mutants using CRISPR/Cas9 (Figure 1—figure supplement 1A). We recovered 8 bp and 29 bp deletion alleles that cause frameshifts, truncating Vg1 from a 355 amino acid protein to predicted 18 and 11 amino acid peptides, respectively (Figure 1—figure supplement 1B). Zygotic homozygous vg1 (Zvg1) mutants were viable, with no strong left-right asymmetry defects (Figure 1—figure supplement 2), allowing the generation of maternal vg1 (Mvg1) mutants from homozygous females crossed to wild-type males (Figure 1A). Mvg1 embryos lacked the derivatives of the mesendoderm, including heart, blood, pronephros, notochord, gut and trunk somites (Figure 1A). To test whether the phenotype is caused by the loss of vg1, we performed rescue experiments by injecting 5 concentrations of vg1 mRNA, spanning a 1600-fold range. 0.5–100 pg of vg1 rescued the phenotype, revealing that the embryo can tolerate a large range of vg1 concentrations (Figure 1B). 50 pg of a vg1 mRNA containing the 8 bp deletion found in the genetic mutant was unable to rescue the phenotype (Figure 1C). In contrast to previous vg1 morpholino experiments (Peterson et al., 2013), these results reveal that vg1 is essential for mesendoderm formation. Maternal vg1 is required for mesendoderm formation. (A) Zygotic and maternal vg1 (Zvg1 and Mvg1) mutants and wild-type (WT) embryo at 28 hours post-fertilization (hpf). See Figure 1—figure supplement 1 for information about the vg1 mutant alleles, and Figure 1—figure supplement 2 for analysis of left-right asymmetry in WT and Zvg1 embryos. (B) Mvg1 embryos injected with 0.0625–100 pg of vg1 mRNA. (C) Mvg1 embryo injected with 50 pg of vg1 mRNA containing the 8 bp deletion found in the genetic mutants (vg1a164). The phenotype of Mvg1 and maternal-zygotic vg1 (MZvg1) embryos closely resembles that of embryos that lack Nodal (Feldman et al., 1998), its co-receptor Oep (Gritsman et al., 1999), or its signal transducer Smad2 (Dubrulle et al., 2015) (Figure 2A). To determine whether Mvg1 embryos are defective in Nodal signaling, we analyzed the expression of a selection of Nodal target genes. The expression of these mesendoderm genes showed the same defects in Mvg1 mutants as in Nodal signaling mutants, indicating that Nodal signaling is not functional in the absence of Vg1 (Figure 2B). Endogenous Nodal signaling requires Vg1. (A) Mvg1, maternal-zygotic vg1 (MZvg1) and maternal-zygotic oep (MZoep) mutants at 28 hpf. (B) Expression of Nodal target genes gsc, lft1 and ntl at 50% epiboly and sox32 at 90% epiboly in WT, Mvg1 and MZoep embryos. (C) cyc and sqt expression at 4 and 6 hpf in WT and Mvg1 embryos. (D) gsc expression at 50% epiboly in WT and Mvg1 embryos injected with 50 pg of cyc mRNA, 50 pg or 0.2 pg of sqt mRNA. (E) qPCR of lft1 expression at 50% epiboly relative to ef1a in WT and Mvg1 embryos injected with 0.2 pg or 2 pg of sqt mRNA. The mean and standard error of the mean (SEM) was plotted. (F) qPCR of lft1 expression at 50% epiboly relative to ef1a in embryos injected with 20 pg of cyc mRNA in combination with 0.5 pg or 5 pg of vg1 mRNA. The mean and SEM was plotted. (G) Anti-GFP reducing immunoblot of WT and Mvg1 embryos injected with 50 pg of cyc-sfGFP or sqt-sfGFP mRNA. Black arrowhead indicates the position of full-length protein, open arrowhead indicates processed protein. 8 embryos at 50% epiboly were loaded per well. (H) Live imaging of the animal cap of sphere-stage WT and Mvg1 embryos injected with 50 pg of cyc-sfGFP or sqt-sfGFP mRNA. Scale bar, 17 um. One way Nodal signaling might be disrupted in Mvg1 embryos is through loss of Nodal gene expression. We analyzed cyc and sqt expression in wild-type and Mvg1 embryos. cyc and sqt were initially expressed at comparable levels across both genotypes, but mRNA levels subsequently increased in wild-type embryos by autoregulation (Meno et al., 1999) while they generally remained low in Mvg1 embryos (Figure 2C). These results suggest that Vg1 is required for the auto-induction but not initiation of Nodal gene expression, and that the remaining endogenous levels of Nodal are not able to induce mesendoderm in the absence of Vg1. To test whether the Nodal ligands might be inactive in the absence of Vg1, we overexpressed cyc or sqt in Mvg1 embryos and analyzed Nodal target gene expression. High levels (50 pg of mRNA) of cyc failed to induce target gene expression in Mvg1 embryos (Figure 2D), whereas sqt at low (0.2 pg) but not high (2–50 pg) levels of overexpression failed to induce target gene expression (Figures 2D and E). We then co-expressed 20 pg of cyc mRNA with increasing concentrations of vg1 mRNA in Mvg1 embryos. Co-expression of cyc and 5 pg of vg1 caused an increase in induction of Nodal target gene expression compared to cyc alone (Figure 2F). These results indicate that Vg1 is necessary for Cyc activity and partially needed for Sqt activity. To determine whether the Nodal ligands are processed and secreted in Mvg1 embryos, we expressed superfolderGFP (sfGFP)-tagged derivatives of Cyc and Sqt (Müller et al., 2012; Pédelacq et al., 2006). No differences in cleavage or localization of Cyc and Sqt were detected in the presence or absence of Vg1 (Figures 2G and H). Taken together, these results suggest that Vg1 is necessary for the endogenous activities, but not the processing and secretion, of Cyc and Sqt. Previous studies did not detect Vg1 processing in early embryos (Dale et al., 1989; Dohrmann et al., 1996; Tannahill and Melton, 1989; Thomsen and Melton, 1993). To examine the relationship of Vg1 processing to presence or absence of Nodal proteins, we first inserted sfGFP downstream of the Vg1 cleavage site (Figure 3A). vg1-sfGFP rescued Mvg1 mutants (Figure 3B) but cleavage of Vg1 protein was undetectable (Figure 3C). To test whether Vg1 needs to be processed to be functional, we mutated the basic residues in the Vg1 cleavage site to non-basic residues (Vg1-NC, ‘Non-Cleavable’ (Figure 3E)). This abolished Vg1 rescuing activity (Figure 3D), suggesting that endogenous Vg1 cleavage is not detectable but is required for Vg1 function. (A) superfolderGFP (sfGFP) was inserted into vg1 downstream of the predicted basic cleavage site. (B) Mvg1 embryo injected with 50 pg of vg1-sfGFP mRNA, shown at 28 hpf. (C) Anti-GFP reducing immunoblot of WT and Mvg1 embryos injected with 50 pg of vg1-sfGFP mRNA. Black arrowhead indicates full-length Vg1-sfGFP; open arrowhead indicates the predicted size of cleaved Vg1-sfGFP. 8 embryos at 50% epiboly were loaded per well. (D) Mvg1 embryo injected with 50 pg of non-cleavable vg1 mRNA (vg1-NC, RSRRKR->SQNTSN), shown at 28 hpf. Embryos were injected with up to 200 pg of vg1-NC mRNA with no rescue. (E) Anti-GFP reducing immunoblot of Mvg1 embryos injected with 10 pg of vg1-sfGFP or vg1-NC-sfGFP mRNA and 10 pg of cyc or sqt mRNA. Black arrowhead indicates full-length Vg1-sfGFP, open arrowhead indicates cleaved Vg1-sfGFP. Molecular weights in kDa. 8 embryos at 50% epiboly were loaded per well. See also Figure 3—figure supplement 1. Given that the Mvg1 phenotype resembles Nodal loss-of-function phenotypes, and Vg1 requires its cleavage site, we asked whether Nodal might induce Vg1 cleavage. We co-expressed vg1-sfGFP with cyc or sqt and discovered that Vg1-sfGFP was cleaved to its mature form in the presence of Nodal (Figure 3E, Figure 3—figure supplement 1). By contrast, Vg1-sfGFP was not cleaved upon co-expression with an alternative TGF-beta-related ligand, bmp7a (Figure 3—figure supplement 1B), and non-cleavable Vg1-sfGFP (Vg1-NC-sfGFP) was not cleaved in the presence of Cyc or Sqt (Figure 3E, Figure 3—figure supplement 1A). These data reveal that Nodal induces Vg1 processing. To examine the secretion and localization of Vg1, we expressed vg1-sfGFP in wild-type or Mvg1 embryos for in vivo imaging. In contrast to the extracellular localization of Cyc and Sqt (Figure 2H), Vg1 was only detected intracellularly, predominantly in the endoplasmic reticulum (ER) (Figure 4A) (Fodero-Tavoletti et al., 2005; Southall et al., 2006; Szul and Sztul, 2011; Tu et al., 2002). (A) Live imaging of Mvg1 embryo injected with 50 pg of vg1-sfGFP mRNA. Scale bar, 17 um. (B) Mvg1 embryos co-injected with 50 pg of vg1-sfGFP mRNA and 50 pg of cyc, sqt or bmp7a mRNA. Scale bar, 17 um. See also Figure 4—figure supplement 1A. (C) Mvg1 embryo co-injected with 50 pg of pH-sensitive fluorescent vg1 (vg1-pHluorin2) and 50 pg of cyc mRNA. Scale bar, 17 um. See also Figure 4—figure supplement 1B. (D) Mvg1 embryo co-injected with 50 pg of vg1-sfGFP mRNA at the 1-cell stage and 10 pg of cyc-RFP mRNA into 1 cell at the 16-cell stage. Scale bar, 100 um. (E) Mvg1 embryos co-injected with 50 pg of vg1-sfGFP mRNA and 50 pg of cyc- or sqt-RFP mRNA. Arrowheads indicate examples of co-localization. Scale bar, 17 um. See also Figure 4—figure supplement 1C. To determine whether Nodal can induce not only Vg1 processing but also secretion, we co-expressed vg1-sfGFP with cyc or sqt. Notably, Vg1-sfGFP formed extracellular puncta and/or diffuse extracellular signal upon co-expression with cyc or sqt (Figure 4B, Figure 4—figure supplement 1A, Table 1). By contrast, Vg1-sfGFP was not secreted upon co-expression with bmp7a (Figure 4B). Quantification of Vg1-sfGFP localization in Mvg1 embryos co-injected with 20 pg of vg1-sfGFP mRNA and 0.5–20 pg of cyc or sqt mRNA. 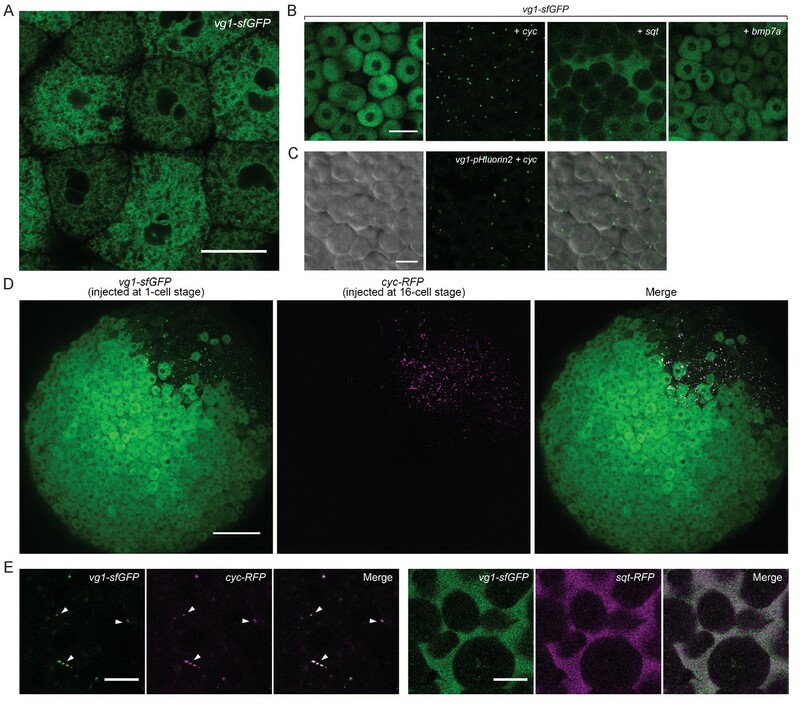 See Figure 4—figure supplement 1A for examples of Vg1-sfGFP extracellular localization. To directly test whether Vg1 is secreted in the presence of Nodal, we tagged Vg1 with the pH-sensitive fluorescent protein pHluorin2 (Mahon, 2011). pHluorin2 is non-fluorescent at acidic pH, as found in intracellular vesicles, but it fluoresces in the neutral pH of the extracellular space. Vg1-pHluorin2 fluorescent puncta were only visible upon co-expression with cyc or sqt, indicating that Vg1 is secreted in the presence of Nodal (Figure 4C, Figure 4—figure supplement 1B). To independently test if Vg1 is only secreted in the presence of Nodal, we expressed vg1-sfGFP in single-cell embryos and co-expressed cyc-RFP in 1 cell at the 16-cell stage. At sphere stage, Vg1-sfGFP was only secreted in the cells that also expressed Cyc-RFP (Figure 4D). To determine whether Vg1 and Nodal co-localize, we co-expressed vg1-sfGFP with cyc-RFP or sqt-RFP. Vg1-sfGFP displayed extensive extracellular co-localization with Cyc-RFP and Sqt-RFP (Figure 4E, Figure 4—figure supplement 1C). Taken together, these results reveal that Nodal induces the secretion of Vg1, and that Vg1 and Nodal co-localize. The co-localization of Vg1 and Nodal suggested that these secreted ligands might form heterodimers, as detected for GDF1 and Nodal, and some other TGF-beta-related signals (Aono et al., 1995; Dutko and Mullins, 2011; Eimon and Harland, 2002; Fuerer et al., 2014; Guo and Wu, 2012; Hazama et al., 1995; Israel et al., 1996; Little and Mullins, 2009; Nishimatsu and Thomsen, 1998; Schmid et al., 2000; Shimmi et al., 2005; Suzuki et al., 1997; Tanaka et al., 2007). To test this hypothesis, we performed co-immunoprecipitation experiments by co-expressing 50 pg of vg1-Flag with 50 pg of cyc-HA or sqt-HA. Vg1-Flag co-immunoprecipitated with Cyc-HA or Sqt-HA (Figure 5A, Figure 5—figure supplement 1A). To test the specificity of this interaction we used two different concentrations of sqt-HA mRNA in combination with three different concentrations of vg1-Flag or bmp7a-Flag mRNA. We detected an interaction between Sqt-HA and Vg1-Flag at all six concentrations tested, whereas an interaction between Sqt-HA and Bmp7a-Flag was only detected at the highest concentration of each mRNA (Figure 5—figure supplement 1B). Thus, Vg1 specifically interacts with Nodal to form heterodimers. Vg1 and Nodal form heterodimers, and are only active when co-expressed. (A) Anti-Flag reducing immunoblot (IB) of anti-HA immunoprecipitates (IP) from lysates of Mvg1 embryos injected with 50 pg of cyc-HA, sqt-HA and/or 50 pg of vg1-Flag mRNA. Black arrowhead indicates full-length Vg1-Flag; open arrowhead indicates cleaved Vg1-Flag. See also Figure 5—figure supplements 1A and B. (B) Anti-Flag reducing and non-reducing immunoblots of WT and Mvg1 embryos injected with 50 pg of vg1-Flag, cyc-Flag or bmp7a-Flag, collected at 50% epiboly. Under reducing conditions the proteins migrated at sizes consistent with the theoretical molecular weights for full-length monomers: Vg1-Flag – 42 kDa; Cyc-Flag – 58 kDa; Bmp7a-Flag – 50 kDa. Open arrowhead indicates where mature Bmp7a-Flag homodimers are expected to migrate as two species under non-reducing conditions (Little and Mullins, 2009). For an annotated gel, see Figure 5—figure supplement 1C. (C) Anti-Flag reducing immunoblot of anti-HA IP from lysates of Mvg1 embryos injected with 50 pg of sqt-HA and vg1-Flag mRNAs or vg1-HA and vg1-Flag mRNAs. Black arrowhead indicates full-length Vg1-Flag; open arrowhead indicates cleaved Vg1-Flag. (D) Transplantation of cells from donor embryos injected with cyc, vg1 or cyc and vg1 mRNAs into host embryos for analysis of Nodal target gene lft1 expression at 50% epiboly. mRNAs were co-injected with sfGFP mRNA to verify successful transplantation using DAB staining (Figure 5—figure supplement 2A). (E) Injection of vg1 mRNA into the yolk syncytial layer (YSL) of Mvg1 mutants, shown at 32 hpf. For Nodal target gene expression in vg1 mRNA YSL-injected embryos see Figure 5—figure supplement 2B. vg1 was co-injected with a fluorescent dextran to verify YSL localization (Figure 5—figure supplement 2C). The heterodimerization of Vg1 and Nodal raises the possibility that Vg1 is maintained in a monomeric state in the absence of Nodal. Indeed, a previous study found that Vg1 does not form homodimers, and that endogenous Vg1 is predominantly monomeric (Dale et al., 1993). To test the monomeric or dimeric states of Vg1 in the absence of Nodal, we performed reducing and non-reducing immunoblots of wild-type and Mvg1 embryos expressing vg1-Flag, cyc-Flag or bmp7a-Flag mRNA. TGF-beta family members are disulfide-linked dimers: under reducing conditions the disulfide bonds are broken, while under non-reducing conditions the bonds are maintained, allowing the detection of dimers. Bmp7a-Flag mature homodimers were visible under non-reducing conditions, whereas Vg1-Flag homodimers were not detected (Figure 5B, Figure 5—figure supplement 1C). Using a complementary approach, we tested whether Vg1 forms homodimers by co-immunoprecipitation. While Sqt-HA and Vg1-Flag co-precipitated, Vg1-HA and Vg1-Flag did not (Figure 5C). These results indicate that Vg1 does not form homodimers and might be present as monomers in the absence of Nodal. Vg1 protein is synthesized before Nodal transcription and translation begin, raising the possibility that newly synthesized Nodal monomers bind to preexisting Vg1 monomers. Alternatively, Nodal might only heterodimerize with Vg1 protein that is co-translated with Nodal. To distinguish between these possibilities, we generated a Vg1-Dendra2 photoconvertible fusion protein and injected it at the 1-cell stage. At the 64-cell stage we photoconverted Vg1-Dendra2 from green to red, and co-injected the embryos with 5 pg of cyc mRNA. Imaging revealed the production of red puncta, indicating that Vg1 protein synthesized prior to Nodal synthesis was able to heterodimerize and be secreted with Nodal (Figure 5—figure supplement 1D). This data suggests that Nodal can heterodimerize with pre-existing Vg1. To determine if co-expression of Vg1 and Nodal in the same cells is required for activity, we used transplantation assays to compare target gene induction in cells co-expressing vg1 and cyc versus neighboring cells expressing either vg1 or cyc. Nodal target gene induction only occurred when vg1 and cyc were co-expressed in the same cells (Figure 5D and Figure 5—figure supplement 2A). Analogously, deposition of vg1 mRNA to the yolk syncytial layer (YSL) of Mvg1 mutants, where cyc and sqt are expressed endogenously, was sufficient to rescue Mvg1 mutants by morphology and gene expression (Figure 5E and Figure 5—figure supplement 2B). Confocal imaging of embryos injected with vg1 mRNA and a fluorescent dextran into the YSL indicated that the majority of fluorescence was localized to the YSL, but a few cells in the margin also inherited the fluorescent dextran (Figure 5—figure supplement 2C). Thus, although vg1 is ubiquitously expressed in the early embryo (Helde and Grunwald, 1993; Peterson et al., 2013) (Figure 5—figure supplement 2D), its co-localization with cyc and sqt is sufficient for its role in mesendoderm formation. Taken together, these results suggest that Vg1 and Nodal are active when expressed in the same cells, where they form heterodimers. The requirement for Vg1-Nodal heterodimers for mesendoderm induction raises the question of why the embryo relies on both a ubiquitous ligand, Vg1, and localized ligands, Cyc and Sqt. We developed a basic kinetic model to test the rate of Nodal homodimer formation versus Nodal-Vg1 heterodimer formation in the presence of a maternal Vg1 pool. Simulating these two conditions revealed that the preloading of inactive Vg1 monomers in the cell allows Nodal to immediately form heterodimers whereas dimer formation is delayed when Nodal must form homodimers (Figure 6). Thus, Vg1-Nodal heterodimers can initiate signaling more quickly than Nodal homodimers, and already at low Nodal levels. Even if Nodal homodimers were as active as Vg1-Nodal heterodimers, Nodal target gene induction would still be slower in the absence of maternal Vg1, because the association of two Nodal monomers is less likely at low Nodal concentrations than Vg1-Nodal dimerization (Figure 6). These simulations reveal that low concentrations of zygotic Nodal can be directly transformed into pathway activation via association with maternal Vg1. Vg1 can enable rapid response to low concentrations of Nodal. Kinetic model comparing Nodal homodimer formation in the absence of Vg1 (red line) and Vg1-Nodal heterodimer formation in the presence of a maternal Vg1 pool (blue line). For both conditions Nodal monomer production begins at 4 hpf (the onset of zygotic transcription and translation, first dotted line) and concludes after mesendodermal patterning (6 hpf, second dotted line). For the heterodimer simulation an excess of Vg1 is provided in the initial conditions. The results in this study indicate that mesendoderm induction depends on the co-expression and heterodimer formation of Nodal and Vg1. This conclusion is based on five new findings: Vg1 is essential for mesendoderm induction; Vg1 is only processed, secreted and active in the presence of Nodal; Nodal activity, but not processing and secretion, depends on Vg1; Vg1 and Nodal form heterodimers; and Vg1-Nodal heterodimers are more active than Nodal alone. Together with previous studies, our findings suggest a unifying 5-step model for mesendoderm induction in zebrafish: (1) vg1 mRNA is inherited from the mother and is ubiquitous in the early embryo; (2) Vg1 protein is synthesized ubiquitously and retained predominantly in the ER; (3) cyc and sqt are transcribed and translated in the YSL; (4) Cyc and Sqt form heterodimers with pre-existing Vg1, resulting in Vg1 secretion and cleavage; (5) Cyc-Vg1 and Sqt-Vg1 heterodimers activate the Nodal signaling pathway to induce mesendoderm (Figure 7). Model for mesendoderm induction in zebrafish. As described in the main text: (1) vg1 mRNA is inherited from the mother, and is ubiquitous in the early embryo; (2) Vg1 protein is synthesized ubiquitously and retained predominantly in the ER; (3) cyc and sqt are transcribed and translated in the YSL; (4) Cyc and Sqt form heterodimers with Vg1, resulting in Vg1 secretion and cleavage; (5) Cyc-Vg1 and Sqt-Vg1 heterodimers activate the Nodal signaling pathway to induce mesendoderm. Knockdown studies in zebrafish suggested no requirement for Vg1 in mesendoderm induction (Peterson et al., 2013), but the loss-of-function mutants reported here reveal that Vg1 is absolutely required for the induction of head and trunk mesoderm and endoderm. Strikingly, vg1 mutants strongly resemble Nodal signaling mutants, showing that zebrafish Vg1 has as essential a function as Nodal, which has been considered the sole mesendoderm inducer. The results in zebrafish warrant a re-analysis of the requirements for Vg1 orthologs in other systems. For example, mouse Gdf1;Gdf3 double mutants have incompletely penetrant mesendodermal phenotypes (Andersson et al., 2007). A closer comparison to Nodal mutants might reveal functions of GDF1 and GDF3 that are equivalent to Vg1. It is also possible that mouse Nodal is expressed at sufficiently high levels to be less dependent on GDF1/GDF3, akin to the overexpression of zebrafish sqt. Similarly, zebrafish southpaw might be expressed at high enough levels to act independently of zygotic vg1 during left-right development. Knockdown studies in Xenopus have suggested that Vg1 is mainly involved in inducing notochord precursors, but not other mesendodermal progenitors (Birsoy et al., 2006). Mutant studies in Xenopus might reveal broader roles for Vg1, or alternatively additional TGF-beta-related signals such as Derrière (Sun et al., 1999), which has been shown to interact with Nodal (Eimon and Harland, 2002), might have complementary or overlapping functions with Vg1. More generally, it is conceivable that the activities of the Nodal and Vg1/GDF1/GDF3 subfamilies are co-dependent in all contexts. This idea is not only supported by the co-dependence of Nodal and Vg1 in zebrafish mesendoderm induction reported here, but also the observation that Nodal expression coincides with the expression of Vg1 family members in numerous contexts (Agius et al., 2000; Levin et al., 1995; Onai et al., 2010; Range and Lepage, 2011; Range et al., 2007; Seleiro et al., 1996). Moreover, mouse Gdf1 mutants display very similar left-right defects as mutants with impaired Nodal signaling (Andersson et al., 2006; Cheng et al., 2003; Lowe et al., 2001; Yan et al., 1999). It is therefore tempting to speculate that wherever and whenever Nodal subfamily members are expressed and active, they are accompanied by Vg1 subfamily members. In this scenario, Vg1/GDF1/GDF3 act in parallel with Nodal even when their expression is precedent, and any apparent upstream functions of Vg1 (Andersson et al., 2007; Chen et al., 2006; Rankin et al., 2000; Shah et al., 1997; Skromne and Stern, 2001; Tanaka et al., 2007) are actually the result of Nodal autoinduction: Vg1 is required together with Nodal to fully activate Nodal gene expression but it is not needed for the initiation of Nodal expression, as shown in the Mvg1 mutants. Finally, Nodal and Vg1 act through the same co-receptors (Andersson et al., 2007; Cheng et al., 2003; Fuerer et al., 2014; Tanaka et al., 2007) and are both inhibited by Lefty ligands (Agathon et al., 2001; Bisgrove et al., 1999; Chen and Shen, 2004; Chen and Schier, 2002; Cheng et al., 2004; Meno et al., 1999; 1996; Thisse et al., 2000; Thisse and Thisse, 1999). These observations suggest that Nodal signaling should henceforth be considered Nodal/Vg1 signaling. Our study clarifies previously puzzling observations on the activity and processing of Vg1 that contrast with the properties of other TGF-beta-related signals: overexpression of wild-type vg1 does not cause a phenotype (Dale et al., 1993; Dohrmann et al., 1996; Tannahill and Melton, 1989; Thomsen and Melton, 1993), neither secreted (Dale et al., 1993; Tannahill and Melton, 1989) nor processed Vg1 has been reliably detected (Dale et al., 1989; Dohrmann et al., 1996; Tannahill and Melton, 1989; Thomsen and Melton, 1993), but fusion of the Vg1 mature domain to the Activin or BMP prodomain results in processed and active Vg1 (Dale et al., 1993; Dohrmann et al., 1996; Kessler and Melton, 1995; Thomsen and Melton, 1993; Wall et al., 2000). Our study explains these conundrums by revealing that Vg1 is only processed, secreted and active in the presence of Nodal. Without Nodal, Vg1 is unprocessed and predominantly resides in the ER. Upon overexpression, Vg1 contributes to this inert pool, and only fusion to heterologous prodomains allows secretion, cleavage and activation in the absence of Nodal. Thus, the dependence of Vg1 processing, secretion and activity on Nodal accounts for many of the previously confusing observations. One conundrum remains: we and others have not been able to detect the processing (Figure 3C) or secretion (Figure 4A) of Vg1 at endogenous levels of Nodal. We speculate that endogenous Nodal is expressed at very low levels and in few cells, resulting in cleavage and secretion of only a small (and undetectable) fraction of the total pool of Vg1. Only upon ectopic Nodal expression, sufficiently high levels of Vg1 are processed to become detectable. The development of more sensitive detection methods is needed to directly demonstrate the cleavage, processing and secretion of endogenous Vg1. 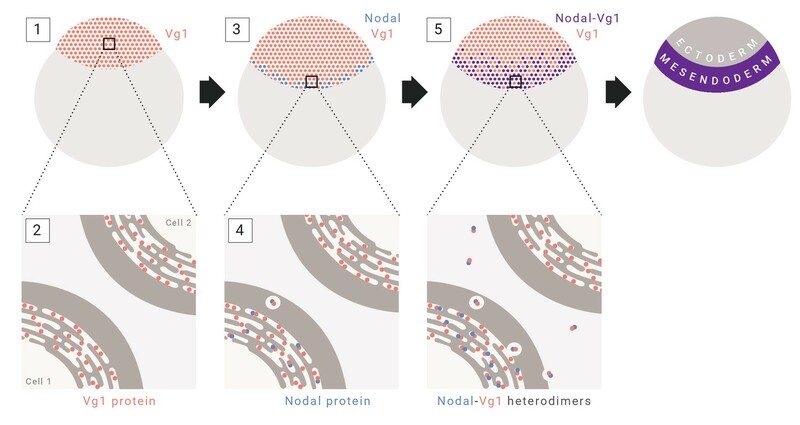 Our study reveals that Nodal and Vg1 form heterodimers, and that Vg1 exists in a monomeric state prior to heterodimerization with Nodal. The initial localization of Vg1 to the ER suggests that this is the site of heterodimerization, which is consistent with previous studies of other heterodimers (Duitman et al., 2008; Hurtley and Helenius, 1989; Jalah et al., 2013; Lorenz et al., 2002; Persson and Pettersson, 1991; Tu et al., 2002). For example, in the case of the uroplakin proteins UPIb and UPIII, UPIb can autonomously exit the ER and translocate to the plasma membrane. By contrast, UPIII must heterodimerize with UPIb in the ER in order to exit and move to the plasma membrane (Tu et al., 2002). Although we currently favor a model in which monomeric Vg1 meets Nodal in the ER, more complex scenarios are conceivable. For example, it is unclear whether pre-existing Vg1 might associate with other ER-resident proteins to maintain or prepare it in a state that allows dimerization with newly synthesized Nodal. Our results suggest that Nodal-Vg1 heterodimers are more potent than Nodal alone: in the case of Cyc, such heterodimers seem to be required for Cyc to activate signaling, whereas Sqt-Vg1 heterodimers appear to be more active than Sqt alone (Figures 2D, E and F). The molecular basis of the increased activity is unknown, but based on previous studies in the BMP system, heterodimers might be necessary to assemble heteromeric combinations of two types of class I or II receptors (Little and Mullins, 2009). Our results also extend and generalize the previous observation that mouse GDF1 and Nodal form heterodimers (Fuerer et al., 2014; Tanaka et al., 2007), although those studies did not address the requirement, localization, or processing of Vg1/GDF1/GDF3 during mesendoderm formation, and instead proposed that heterodimer formation might increase the potency and/or range of Nodal. Our results uncover the alternative or additional mechanism that heterodimer formation triggers processing and secretion of Vg1 and allows Nodal to be active at physiological concentrations. Our results demonstrate a novel mode to restrict TGF-beta-related protein activity through heterodimer formation. vg1 mRNA and protein do not need to be localized in the embryo to restrict Vg1 activity: instead, it is the absence of Nodal that blocks Vg1 processing, secretion and activity. Indeed, zebrafish Vg1 is present ubiquitously in early embryos and vg1 is expressed in broader domains than Nodal in all systems analyzed. The question therefore arises whether the exquisite vegetal localization of Xenopus vg1 is important for development (Weeks and Melton, 1987). The localized activation of Xenopus Nodal genes might be sufficient to restrict mesendoderm formation to vegetal and marginal regions, but it is also possible that localized Vg1 provides an additional safeguard to spatially restrict pathway activation. Rescue experiments similar to those reported here could address this question. Modeling of hetero- and homodimerization kinetics reveals that the maternal pool of Vg1 accelerates the onset of ligand dimerization relative to a system that relies on Nodal-Nodal dimerization alone. This could be advantageous in the embryo, where mesendoderm induction cannot initiate until after the maternal-to-zygotic transition. Although it may be counterintuitive for a spatially localized signal to rely on a ubiquitous signal for pathway activation, the preloading of Vg1 in the ER could be instrumental for ensuring Nodal signaling initiates in a rapid and temporally reliable manner. Thus, the requirement for Vg1 in the zebrafish embryo can ensure rapid and sensitive response to the low concentrations of Nodal that initiate mesendoderm induction. The finding that Vg1 – together with Nodal – is an endogenous mesoderm inducer resolves some of the historical controversies in the field. Vg1 was described in 1987 as a TGF-beta-related signal present at the right time and place to be a mesoderm inducer (Weeks and Melton, 1987), but the lack of a functional requirement raised doubts about its importance. Conversely, Activin was reported in 1990 as a TGF-beta-related signal that can induce mesoderm (Smith et al., 1990; van den Eijnden-Van Raaij et al., 1990), but its absence during early embryogenesis (Dohrmann et al., 1993; Thomsen et al., 1990), and the lack of loss-of-function phenotypes (Hawley et al., 1995; Kessler and Melton, 1995; Matzuk et al., 1995; Schulte-Merker et al., 1994; Sun et al., 1999), raised doubts about its importance (Schier and Shen, 2000). With the discovery of the essential roles of mouse Nodal (Conlon et al., 1994; Zhou et al., 1993) and zebrafish Nodal (Feldman et al., 1998) in mesoderm induction, the field converged to the view that Nodal is the key inducer. Our study indicates instead that Nodal-Vg1 heterodimers are the essential endogenous inducers of mesendoderm, while Activin serves as a powerful reagent to induce mesendoderm from embryonic stem cells. sgRNAs targeting the vg1/dvr1/gdf3 gene were designed using CHOPCHOP (RRID:SCR_015723) (Labun et al., 2016; Montague et al., 2014) and synthesized as previously described (Gagnon et al., 2014) (See also Figure 1—figure supplement 1). vg1 sgRNAs were co-injected with ~0.5 nL of 50 μM Cas9 protein into TLAB wild-type embryos. Injected embryos were raised to adulthood and outcrossed to TLAB adults. Clutches of embryos with potential heterozygous individuals were used to identify founders with germline mutations in vg1 by extracting DNA from 10 embryos and genotyping by MiSeq sequencing. The offspring of confirmed founders were raised to adulthood and genotyped to identify heterozygous vg1 adults. Heterozygous vg1 mutants were intercrossed to generate zygotic homozygous (Zvg1) fish. For maintaining the vg1 mutant line, homozygous Zvg1 male fish were crossed to heterozygous female fish, and the resulting progeny were genotyped to identify Zvg1 adults. To generate maternal vg1 (Mvg1) mutants, TLAB wild-type male fish were crossed to homozygous Zvg1 female fish. Two deletion alleles of 8 bp and 29 bp (vg1a164 and vg1a165 respectively) were recovered in the first exon of vg1 from the sgRNA targeting the sequence GGGTCAGAAGACAGGCTCTGAGG. Genomic DNA was extracted using the HotSHOT method (Meeker et al., 2007) and PCR was performed using standard conditions (see primer sequences below), followed by Sanger sequencing or MiSeq sequencing for the 8 bp allele (Gagnon et al., 2014) or 2% gel electrophoresis for the 29 bp allele. The vg1 CDS sequence was PCR amplified from a high-stage cDNA library and cloned into the pSC vector (Agilent) with a beta-globin 5’UTR and an SV40 3’UTR using Gibson assembly (Gibson et al., 2009) to generate pSC-vg1. To generate pCS2(+)-cyc and pCS2(+)-sqt, the cyc and sqt CDS sequences were PCR amplified from a high-stage cDNA library and cloned into the pCS2(+) vector using Gibson assembly. To generate non-cleavable forms of vg1 and vg1-sfGFP, site-directed mutagenesis was used to replace the RSRRKR cleavage site with SQNTSN using a Q5 Site-Directed Mutagenesis Kit (NEB). All superfolder GFP (sfGFP) (Pédelacq et al., 2006), RFP, Dendra2 and pHluorin2 (Mahon, 2011) fusion constructs were generated by PCR-based methods and cloned into the pCS2(+) vector using Gibson assembly. Flag (DYKDDDDK) and HA tag (YPYDVPDYA) sequences were inserted by site-directed mutagenesis of pSC-vg1, pCS2(+)-cyc and pCS2(+)-sqt. For Vg1 fusions, sequences encoding the fluorescent protein or Flag tag were inserted downstream of the cleavage site (RSRRKR) with a GSTGTT linker separating the prodomain and fluorescent protein, and a GS linker separating the fluorescent protein and the Vg1 mature domain. For Cyc fusions, sequences encoding the fluorescent proteins or HA tag were inserted two amino acids downstream of the cleavage site (RRGRR) (Müller et al., 2012). For Sqt fusions, fluorescent protein and HA tag sequences were inserted 10 amino acids downstream of the cleavage site (RRHRR) with a GSTGTT linker separating the prodomain and fluorescent protein, and a GS linker separating the fluorescent protein and the mature domain (Müller et al., 2012). Vectors were linearized by digestion with NotI (pCS2(+) vectors) or XhoI (pSC vectors). Capped mRNAs were synthesized using the SP6 or T7 mMessage Machine Kits (ThermoFisher), respectively. For in situ hybridization, immunoblot, imaging and qPCR experiments, embryos were dechorionated using 1 mg/ml Pronase (Protease type XIV from Streptomyces griseus, Sigma) prior to injection, and subsequently cultured in agarose-coated dishes. Embryos were injected at the 1-cell stage unless otherwise stated. Zebrafish embryos were grown at 28°C and staged according to (Kimmel et al., 1995). Embryos were cultured in blue water (250 mg/L Instant Ocean salt, 1 mg/L methylene blue in reverse osmosis water adjusted to pH 7 with NaHCO3). Embryos were analyzed for mutant phenotypes at 28–32 hpf. For imaging, embryos were anesthetized in Tricaine (Sigma) and mounted in 2% methylcellulose then imaged using a Zeiss SteREO Discovery.V12 microscope. Embryos were raised to sphere stage and mounted in 1% low gelling temperature agarose (Sigma) on glass-bottomed dishes (MatTek) with the animal pole facing the glass. Imaging was performed on Zeiss LSM 700 and LSM 880 inverted confocal microscopes. Embryos were injected at the 1-cell stage with 100 pg of vg1-Dendra2 mRNA then grown at 28°C to the 64-cell stage and injected with 5 pg of cyc mRNA into six locations in the embryo. Embryos were mounted in 1% low gelling temperature agarose and photoconverted with 2 min of UV light at 10x magnification on the Zeiss LSM 700 inverted confocal microscope. The embryos were incubated at 28°C for 30 min before imaging on the LSM 700 microscope over a period of 2 hours. Images were processed in FIJI/ImageJ (Schindelin et al., 2012). Brightness, contrast and color balance was applied uniformly to images. Embryos were fixed in 4% formaldehyde overnight at room temperature (50% epiboly or younger) or at 4°C (embryos older than 50% epiboly). Whole mount in situ hybridizations were performed according to standard protocols (Thisse and Thisse, 2008). DIG-labeled antisense RNA probes against cmlc2, spaw, gsc, lft1, ntl, sox32, cyc, sqt and vg1 were synthesized using a DIG Probe Synthesis Kit (Roche). NBT/BCIP/Alkaline phosphatase-stained embryos were dehydrated in methanol and imaged in benzyl benzoate:benzyl alcohol (BBBA) using a Zeiss Axio Imager.Z1 microscope. For DAB staining, embryos were rehydrated in PBST after completing the in situ protocol, and blocked in 10% normal goat serum/1% DMSO before incubation in primary antibody overnight (1:400 rabbit anti-GFP-HRP, ThermoFisher A10260, RRID:AB_2534022). Embryos were washed multiple times in PBST, incubated in DAB solution (KPL #71-00-48), and dehydrated before imaging in BBBA. For transplantation experiments, donor embryos were injected with 50 pg of cyc mRNA and/or vg1 mRNA and 50 pg of GFP mRNA and grown to sphere stage (4 hpf). At sphere stage, cells were transplanted from donor embryos to host embryos, and host embryos were grown to shield stage before fixation for in situ hybridization. For YSL injections, 1000-cell stage embryos were injected through the chorion into the YSL with approximately 100 pg of vg1 mRNA and 500 pg of Alexa Fluor 488 dextran (ThermoFisher). Embryos were injected at the 1-cell stage with 50 pg of each mRNA (unless otherwise stated) and grown to early gastrulation (50% epiboly). 8 embryos per sample were manually deyolked with forceps and frozen in liquid nitrogen. The samples were boiled at 95°C for 5 min with 2x SDS loading buffer (10 μL) and DTT (reducing gels only, 150 mM final concentration) and then loaded onto Any kD protein gels (Bio-Rad). Samples were transferred to polyvinylidene fluoride (PVDF) membranes (GE Healthcare). Membranes were blocked in 5% non-fat milk (Bio-Rad) in TBST and incubated overnight at 4°C in primary antibodies (1:5000 rabbit anti-GFP, ThermoFisher A11122, RRID:AB_221569; 1:2000 rabbit anti-Flag, Sigma F7425, RRID:AB_439687). Proteins were detected using HRP-coupled secondary antibody (1:15,000 goat anti-rabbit, Jackson ImmunoResearch Labs 111-035-144, RRID:AB_2307391). Chemiluminescence was detected using Amersham ECL reagent (GE Healthcare). Dechorionated embryos were injected at the 1-cell stage with 5, 20 or 50 pg of mRNA encoding epitope-tagged constructs and grown to 50% epiboly. 50–100 embryos were transferred to 400 μL of cold lysis buffer (50 mM Tris at pH 7.5, 150 mM NaCl, 1 mM EDTA, 10% glycerol, 1% Triton X-100 and protease inhibitors, Sigma 11836170001) and crushed using a homogenizer and disposable pestles before incubation on ice for 30 min with vortexing every 5 min. Samples were spun at maximum speed at 4°C for 30 min and the supernatant was transferred to tubes containing 50 μL of anti-HA affinity matrix (Roche 11815016001, RRID:AB_390914) that was pre-washed twice in lysis buffer. Samples were placed on a rotating platform at 4°C overnight. The matrix was spun down for 2 min at 3000 rcf and washed in 600 μL of cold wash buffer (50 mM Tris at pH 7.5, 150 mM NaCl, 1% Triton X-100 and protease inhibitors) 5 times. 2x SDS loading buffer and DTT (150 mM final concentration) was added to the matrix in 10 μL of wash buffer. Immunoblots were performed as above. Embryos were injected at the 1-cell stage with sqt, cyc and/or vg1 mRNAs and grown to 50% epiboly. For the sqt experiment (Figure 2E) 2 sets of 10 embryos were collected per condition; for the cyc experiment (Figure 2F) 2 sets of 12 embryos were collected per condition. Embryos were flash frozen in liquid nitrogen and RNA was extracted using an E.Z.N.A. Total RNA Kit (Omega) and reverse transcription was carried out using an iScript cDNA Synthesis Kit (Bio-Rad). qPCR reactions were run on a CFX96 machine (Bio-Rad) using iTaq Universal SYBR Green Supermix (Bio-Rad) and 0.25 μM of primers (see primer sequences below). Gene expression levels were calculated relative to a reference gene, ef1a. The mean and standard error of the mean was plotted for each condition. Two technical replicates in addition to biological replicates were used per condition. Both experiments were performed multiple times. In the ‘primed model’, Vg1 is already present in excess when Nodal production begins. This model describes the dynamics of Nodal monomers (N), Vg1 monomers (V) and Nodal-Vg1 dimers (D). Assumptions: constitutive production of N (rate λN), first-order degradation (component half-lives of ln2/βN and ln2/βV, respectively) and bimolecular heterodimerization with rate λDNV. Vg1 is assumed to be maternally deposited, and is thus provided to the system via the initial conditions. In the ‘cold-start’ model, Nodal monomers accumulate and dimerize after the onset of Nodal production. This model describes the dynamics of Nodal monomers (N), Vg1 monomers (V) and Nodal-Nodal dimers (D). Assumptions: constitutive production of N (rate λN), first-order degradation (component half-life of ln2/βN) and bimolecular homodimerization with rate λDN2. The system begins with an excess of V, representing maternally deposited Vg1. All other component concentrations begin at 0, and Nodal monomer production is assumed to be off. Nodal monomer production begins at 4 hpf (the onset of zygotic transcription and translation) and concludes after mesendodermal patterning (6 hpf). The concentration of dimer (either Vg1-Nodal heterodimer or Nodal-Nodal homodimer) was plotted. Biochemical and Biophysical Research Communications 210:670–677. Cancer and Metastasis Reviews 35:21–39. Current Opinion in Genetics & Development 19:302–307. Molecular and Cellular Biology 28:4851–4861. Journal of Biological Chemistry 289:17854–17871. Cytokine & Growth Factor Reviews 23:61–67. Biochemical and Biophysical Research Communications 209:859–866. Journal of Biomedical Materials Research Part A 102:4027–4036. Annual Review of Cell Biology 5:277–307. The Journal of Biological Chemistry 288:6763–6776. Current Topics in Developmental Biology 55:143–171. Advances in Bioscience and Biotechnology 2:132–137. Philosophical Transactions of the Royal Society B: Biological Sciences 369:20130539. The Journal of Cell Biology 163:303–314. The Journal of Cell Biology 112:257–266. The International Journal of Biochemistry & Cell Biology 45:885–898. Effects of truncated activin and FGF receptors and of follistatin on the inducing activities of BVg1 and activin: does activin play a role in mesoderm induction? Philosophical Transactions of the Royal Society B: Biological Sciences 371:20150401. Biochemical and Biophysical Research Communications 232:153–156. Journal of Cell Science 120:2078–2090. Cellular and Molecular Life Sciences 63:672–685. Molecular Biology of the Cell 13:4221–4230. Thank you for submitting your article "Vg1-Nodal heterodimers are the endogenous inducers of mesendoderm" for consideration by eLife. Your article has been reviewed by three peer reviewers, and the evaluation has been overseen by a Reviewing Editor and Didier Stainier as the Senior Editor. The following individuals involved in review of your submission have agreed to reveal their identity: Lilianna Solnica-Krezel (Reviewer #3). 1) In revising the manuscript, further experiments are necessary to clarify some basic issues about the model. For example, why Vg1 remains as monomers and thus available to dimerize with Nodal. The suggested experiment is to perform additional WB under-non reducing conditions to test this. It would also be advisable to experimentally clarify where exactly in the cell heterodimerization is occurring. Additionally two of the reviewers raise the issue as to why heterodimers are required to mediate nodal signaling versus homodimers? It would be important to show a direct interaction between these heterodimers and the nodal receptor complexes. An alternative approach would be to over-express different relative amounts of Vg1 and Nodal in Vg1 mutants and use Phospho-Smad2 activity as a read-out (as suggested by reviewer 2). 2) Two of the reviewers raise concerns with the Vg1 mutant rescue by YSL injection of Vg1. In particular reviewer 3 requests that the experiment be repeated using lineage tracing to show that the injection is confined to the YSL, ideally with the inclusion of Smad2 staining as further verification. Typically, when requesting revisions, eLife decision letters only include a summary of the major concerns discussed by the editors and the referees, but we considered that the authors would benefit from receiving the full reviews verbatim in this occasion so that they can attend to as many of the points raised as possible, and also see that the reviewers were uniformly very positive. This is a very important paper to the field showing that Vg1-Nodal heterodimers are essential to induce mesendoderm in zebrafish and likely more broadly in vertebrates. Vg1 has a long history in the field, but its endogenous function has been previously untested in a rigorous manner. This paper by Montague and Schier shows convincingly that Vg1 can only be processed and secreted when it heterodimerizes with Nodal, and that Nodal homodimers do not function in the absence of Vg1, unless highly overexpressed (Sqt only). Strong evidence has previously implicated Gdf-Nodal heterodimers in left-right patterning, so it is likely that Nodal-Vg1 heterodimers function exclusively in signaling. The results are all convincing but some points need addressing to improve the manuscript. The kinetic model assumes that Vg1 would remain as monomers ready to heterodimerize with Nodal, which is a major assumption of the model and should be mentioned. Vg1 alone would be expected to homodimerize if Nodal is not present. Do the authors have evidence for Vg1 remaining as a monomer in the absence of Nodal? Non-reducing Western blot conditions could provide evidence for this. The authors should also provide more information on where dimerization is known to occur (Golgi?) and how it is regulated to provide more plausibility to the model? The authors have stated that unprocessed Vg1 resides in the ER but haven't provided evidence to support this. They should either provide data to support this ER retention or soften their statements throughout. The starting level of Vg1 in the model at 4 hpf is assumed to be 1000 nM, which is extremely high, especially considering that the mRNA is at very low levels at this point, although protein could be higher but are unknown. Provide modeling results when Vg1 monomers are at 500 nm or a more reasonable level of 50 or 100 nm. It would be helpful if the authors could comment on why Vg1-Nodal heterodimers are required for signaling. Readers will want to know possible functions for a heterodimer that the Nodal homodimer cannot provide or at least comment that it is unclear at this point. Perhaps I missed this in the paper. It would be helpful if the authors commented further on the rescue of Mvg1 mutants by YSL injection of vg1 mRNA at the 1000-cell stage, a stage after zygotic transcription has initiated. This suggests that a large maternal pool of unprocessed Vg1 is not essential for Nodal-Vg1 heterodimer formation and function in mesendoderm induction. Additionally comment on the sufficiency of Nodal-Vg1 production in the YSL, which may have been previously performed with Nodal. Is the zygotic marginal domain of sqt/cyc RNA expression not essential then in these conditions? Additionally, Vg1 is localized during oogenesis both in Xenopus (vegetal pole) and at animal pole in zebrafish. Since the vegetal localization in Xenopus is mentioned and discussed multiple times, the animal localization of vg1 RNA during oogenesis is worth noting to readers as well. Typically one reason these RNAs are localized during oogenesis is to translationally repress them, which is also worth mentioning, since the authors discuss reasons for localization in the Discussion. Montague and Schier describe the role of Vg1 in mediating Nodal signaling during zebrafish gastrulation. They show that a Vg1 mutant phenocopies Nodal signaling defective mutants, such as the oep and the cyc/squint double mutants, pointing to the possibility that Vg1 is necessary for Nodal signaling during gastrulation. They also show that Vg1 is maternally provided in an inactive form that resides intracellularly and becomes active only when Nodal ligands are produced. They then show that Nodal ligands bind Vg1 and propose a mechanism by which Nodal/Vg1 heterodimers mediate effective nodal signaling. The study is of wide interest as it provides new insight on the Nodal signaling pathway, a conserved pathway involved in embryonic patterning and organogenesis. The experimental data are solid and clearly presented, however a few points need to be clarified prior to publication. 1) The authors claim that Nodal/Vg1 heterodimers mediate Nodal signaling. This statement requires at least direct prove that such heterodimers bind to nodal receptors and, ideally, that they mediate receptor activation. This could be shown by IP experiments showing binding of both Cyc and Vg1 to phosphorylated Nodal receptors. 2) The authors show that Vg1 binds to Cyc and Sqt in vivo by colocalization of tagged versions of these ligands in the extracellular space (Figure 4). These colocalizations should be quantified to show what fraction of extracellular Vg1 is bound to Nodal ligands and vice-versa. Also, in Figure 4: a) Co-expression of cyc and Vg1-GFP changes Vg1 localization from completely intracellular to completely extracellular. Same for co-expression with Sqt (Figure 4B). Is this true? Or is it due to differences in Image exposure? A quantification of this should be provided. Also it would be interesting to know if the fraction of extracellular Vg1 depends on the amount of Nodal ligand provided. b) The distribution of Sqt-dsRED in Figure 4D looks very different from that of Sqt-GFP in Figure 2 and from that of Vg-1 in the presence of Sqt in Figure 2B. Why is this so? 3) If Nodal signaling is mediated by heterodimers of Nodal and Vg1, the extent of Nodal signaling should depend on their stoichiometry. It would be interesting to overexpress different relative amounts of Vg1 and Nodal ligand in Vg1 mutant and analyse Nodal signaling activation (via Smad2 nuclear localization for instance). 4) The authors provide a simple theoretical model to show how the presence of maternally contributed Vg1 speeds up Nodal signaling upon production of Nodal ligands. I feel this is not particularly revealing: the idea that one component of a pathway being readily available speeds up signaling does not require modeling to be put forward. Moreover, the model is based on parameters measured or inferred for the Nodal ligands, which do not necessarily hold true for Vg1. Montague and Schier report on their studies of the developmental roles of the zebrafish Vg1 homolog, a secreted TGFb ligand, which has been proposed to play key roles in specification of mesendoderm in frogs and mouse. However, the specific roles and underlying molecular mechanisms remain disputable. 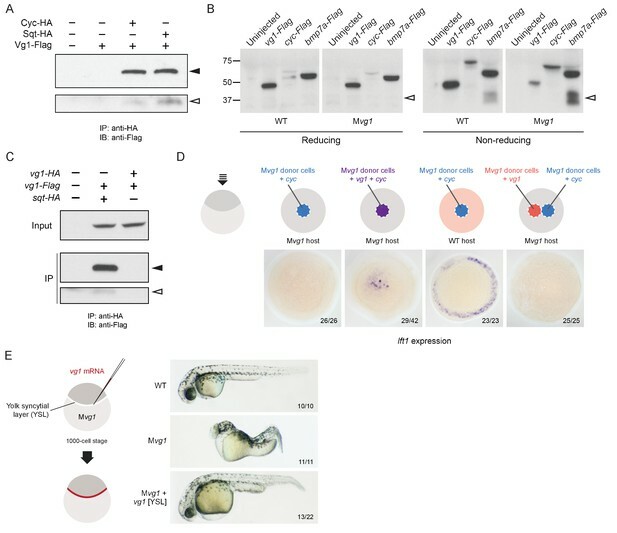 Taking a rigorous reverse genetic approach, and generating two different frame-shifting indel vg1 zebrafish mutants, the authors demonstrate an essential role of maternal vg1 in mesendoderm induction: whereas zygotic vg1 mutants appear normal (but what about left-right asymmetry? ), maternal mutant embryos phenocopy defects observed in the famous Nodal signaling deficient scenarios. The authors provide genetic, biochemical and cell biological evidence that Vg1 processing requires Nodal, and that Vg1 and Nodal (Cyc or Sqt) form heterodimers. Modeling is used to argue that the ubiquitously expressed vg1 allows for faster Nodal signaling. The manuscript clarifies a large body of often incongruent data and models from various vertebrate model systems and advances our understanding of both Vg1 and Nodal signaling during development. Therefore, the manuscript should be of interest to the broad developmental biology community. The manuscript is in general logically presented but scarcity of experimental detail make it difficult to evaluate the presented results. Several conclusions need to be strengthened by additional experiments, and some experiments and their interpretation need clarification. 1) Do the indel vg1 mutations lead to reduction of maternal vg1 message? 2 Are zygotic vg1 mutant truly aphenotypic? What about LR symmetry? 3) Based on the ability of 50 pg of RNA encoding Vg1-NC not to rescue Mvg1 mutant phenotype the authors conclude that endogenous cleavage is required for Vg1 function appears too strong. Higher RNA doses should be tested. 4) Immunoblot experiments presented in Figure 3E should be quantified; there are no loading controls in these experiments. 5) Experiments testing the intracellular localization of Vg1(Cyc;Sqt)-sfGFP would be more compelling if RNAs encoding these molecules would be injected with RNA encoding membraneRFP. 6) What RNA doses were injected in embryos shown in Figure 4? 7) Experiments presented in Figure 4, would be more informative if sqt (bmp) RNAs were co-injected with a lineage tracer. There are two cells in the sqt panel showing intracellular Vg1-sfGFP, likely these cells had little/no Sqt, what would further strengthen the authors' conclusions. 8) "…we performed co-immunoprecipitation experiments and found that Vg1 co-immunoprecipitated with Cyc or Sqt". This sentence could be understood that endogenous proteins were analyzed. Key experimental information is missing about how the relevant tagged proteins were expressed, at what stage of development co-IPs were performed. The co-IP with Cyc-HA is not convincing. 9) The conclusion that co-expression of Vg1 and Nodal in the same cells is required for activity, based on the experiments presented in Figure 5B, C is intriguing, especially for injection of vg1 RNA into the YSL of Mvg1 mutants. Whereas it has been previously shown that Nodal expression in YSL is sufficient to induce mesoderm and endoderm in the overlying blastoderm, this experiment would indicate that Cyc-Vg1 and Sqt-Vg1 heterodimers secreted from YSL are sufficient to create Nodal activity gradient to not only induce but also pattern the blastoderm. However, this experiment raises many questions: has injection been truly confined to the YSL (there is no lineage tracing data presented and a sceptic could argue that the 13 embryos that were rescued express the ligands also in the blastoderm due to ineffective injection? The evidence that expression is confined to the YSL is essential. It would be also important to show that Smad2 activity in such embryos parallels WT pattern shown by the authors in their earlier publications. It would be also important to show that the ligands targeted by RNA injection to the YSL can be seen in extracellular spaces in the blastoderm. 10) How does the above result fit with the models of Nodal autoinduction and self-inhibition? In the model presented in Figure 7 and in the Discussion, the authors see an important role of Sqt and Cyc expressed at the embryonic margin not just in the YSL. 1) In revising the manuscript, further experiments are necessary to clarify some basic issues about the model. For example, why Vg1 remains as monomers and thus available to dimerize with Nodal. The suggested experiment is to perform additional WB under-non reducing conditions to test this. We thank the reviewers for asking us to clarify the monomeric state of Vg1. We present two forms of evidence that suggest Vg1 remains as monomers prior to heterodimerization with Nodal. First, non-reducing western blots with Vg1-Flag (and Bmp7a-Flag as a positive control) show that while Bmp7a forms homodimers under non-reducing conditions, Vg1 does not. Second, by co-IP we detect an interaction between Sqt-HA and Vg1-Flag, but not between Vg1-HA and Vg1-Flag, indicating that Vg1 does not homodimerize. In addition, a previous study found that Vg1 does not form homodimers, and predominantly exists in a monomeric state (Dale et al. EMBO J 1993). We have now referred to this study in the text. It would also be advisable to experimentally clarify where exactly in the cell heterodimerization is occurring. We agree with the reviewers that it would be interesting to visualize where in the cell heterodimerization is occurring. Unfortunately, it is currently not feasible to perform dynamic imaging of the two proteins at the high spatial resolution required to detect heterodimer formation. In the revised manuscript, we raise this question for future studies and discuss previous studies that indicate that the endoplasmic reticulum is a strong candidate for the site of heterodimerization. Additionally two of the reviewers raise the issue as to why heterodimers are required to mediate nodal signaling versus homodimers? We thank the reviewers for raising this point. We have clarified in the text that heterodimers are most likely required to mediate Nodal signaling because they are more potent than homodimers. We have provided additional experimental evidence to support this (Figure 2F and our last response to point 1 below). It would be important to show a direct interaction between these heterodimers and the nodal receptor complexes. An alternative approach would be to over-express different relative amounts of Vg1 and Nodal in Vg1 mutants and use Phospho-Smad2 activity as a read-out (as suggested by reviewer 2). We thank the reviewers for these suggestions. We have overexpressed cyc with different levels of vg1 and performed qPCR to show that the extent of Nodal signaling (measured by lft1 expression) increases with higher levels of co-expression of vg1. We found phospho-Smad2 to be insufficiently quantitative for this experiment. We agree that showing a direct interaction between the heterodimers and Nodal receptor complexes will be an important experiment. However, testing receptor-ligand interactions is currently technically very challenging because the full Nodal receptor complement has not yet been identified and, with the exception of the co-receptor Oep, the zebrafish Nodal receptors have not been defined genetically. We will try to address this point in a follow up study. We thank the reviewers for drawing our attention to this point. In response to the reviewers’ suggestions we performed confocal imaging on embryos co-injected with vg1 and a fluorescent dextran into the YSL at the 1000-cell stage. While the vast majority of fluorescence was localized to the YSL, we found that occasional cells at the margin contain some fluorescent signal. We have therefore revised the text to state that the mRNA was present primarily but not exclusively in the YSL. We have further verified the rescue of the Mvg1 phenotype with gene expression markers of endoderm and mesoderm. We find that while some embryos achieve almost complete rescue, the rescue is not fully penetrant. These results suggest that maternal vg1 is more potent when available earlier and/or more broadly. Thank you for sharing these comments. They helped us further improve the study. […] The kinetic model assumes that Vg1 would remain as monomers ready to heterodimerize with Nodal, which is a major assumption of the model and should be mentioned. Vg1 alone would be expected to homodimerize if Nodal is not present. Do the authors have evidence for Vg1 remaining as a monomer in the absence of Nodal? Non-reducing Western blot conditions could provide evidence for this. We thank the reviewer for raising this important issue. As detailed in our first response to point 1 above, we now provide evidence that Vg1 does not form homodimers. One potential criticism of this model is that Nodal might preferentially heterodimerize with Vg1 protein that is co-translated with Nodal rather than with Vg1 that has already been translated and is latent in the ER. To test this model we injected vg1-Dendra2 mRNA at the 1-cell stage, and photoconverted the Vg1-Dendra2 protein at the 64-cell stage shortly after injecting cyc mRNA. This allowed us to distinguish the early Vg1 protein (red) from the protein co-translated with Cyc (green). Live imaging of these embryos revealed the presence of red puncta, indicating that the Vg1 protein translated prior to Nodal expression can heterodimerize with Nodal (see Figure 5—figure supplement 1D). We thank the reviewer for this comment. We now provide published examples of where in the cell proteins heterodimerize, and find this to predominantly occur in the ER (Hurtley and Helenius, Annu. Rev. Cell Biol.1989). For example, in the case of uroplakins, similarly to Vg1 and Nodal, 1 of the 4 uroplakin proteins is able to independently exit the ER, while the others can only exit upon heterodimerization (Tu et al. Mol. Biol. Cell 2002). The localization pattern of Vg1 is highly indicative of ER retention (see references in the text and Tu et al. 2002). To further clarify this point we expressed an ER protein from yeast (Sec61beta-GFP) in zebrafish embryos. Unfortunately the protein only weakly expressed in zebrafish, and therefore did not provide the resolution required to clearly indicate its subcellular localization. To avoid overstating the data we have adjusted the text to state that Vg1 is “predominantly” localized in the ER. We thank the reviewer for drawing our attention to this. We have adjusted the starting concentration of vg1 in the model to be 100 nM and obtained similar results as before. We agree with the reviewer that we should make this point more clearly. Our data indicates that heterodimers are more potent than homodimers (see Figures 2D, E and F); therefore the simple explanation is that the embryo uses heterodimers because they are more active. We have clarified this in the text and refer to the studies by Mullins and colleagues who show that Bmp2-Bmp7 heterodimers are more potent than a combination of Bmp2 homodimers and Bmp7 homodimers (Little and Mullins, Nat. Cell Biol. 2009). An additional explanation is that maternal vg1 allows embryos to signal at lower concentrations of Nodalbecause the embryo already has Vg1 protein when nodal is transcribed and translated. This point is addressed in Figure 6 with a kinetic model of homodimer versus heterodimer formation. We thank the reviewer for this suggestion. Please see point 2 above. We thank the reviewer for pointing this out. We have added this to the text. […] 1) The authors claim that Nodal/Vg1 heterodimers mediate Nodal signaling. This statement requires at least direct prove that such heterodimers bind to nodal receptors and, ideally, that they mediate receptor activation. This could be shown by IP experiments showing binding of both Cyc and Vg1 to phosphorylated Nodal receptors. We thank the reviewer for this suggestion. Please see our last response to point 1 above. We thank the reviewer for this suggestion. We have included z-stacks of Vg1-sfGFP and Cyc-RFP co-expression to provide a better indication of the extent of co-localization of the two proteins (see Figure 4—figure supplement 1C). Unfortunately, a meaningful quantification of co-localization would be difficult to interpret in this case since Vg1 and Cyc are tagged with two different proteins that have different fluorescent properties. Also, in Figure 4: a) Co-expression of cyc and Vg1-GFP changes Vg1 localization from completely intracellular to completely extracellular. Same for co-expression with Sqt (Figure 4B). Is this true? Or is it due to differences in Image exposure? We thank the reviewer for this observation. We adjusted the laser power when capturing these images to avoid saturation but have provided additional images captured with the same laser power to give a better idea of the relative brightness of the intracellular versus extracellular fractions of Vg1 in the presence of the two Nodal ligands (Figure 4—figure supplement 1A). We find there is variation among embryos in the degree of secretion, but usually when the embryo displays puncta, the majority of Vg1 becomes extracellular. A quantification of this should be provided. Also it would be interesting to know if the fraction of extracellular Vg1 depends on the amount of Nodal ligand provided. We thank the reviewer for this suggestion and have co-expressed vg1-sfGFP with different levels of cyc and sqt. There is a notable amount of variation in the degree of extracellular localization of Vg1-sfGFP in combination with any given concentration of Nodal, so we have not drawn any quantitative conclusions about the effect of changing the ratio of Vg1:Nodal on Vg1 secretion. However, Vg1 secretion is no longer detectable or only detectable in a small number of cells when co-expressed with cyc or sqt at 40x lower concentration. We have quantified the number of embryos with intracellular versus extracellular puncta or diffuse protein localization (Figure 4—figure supplement 1A, Table 1). We thank the reviewer for this careful observation. We have found that co-expression of vg1-sfGFP with sqt can result in two different localization patterns: extracellular diffuse, and extracellular puncta. In light of reviewer 2’s observation we have made this statement more clear in the text, quantified each condition (Table 1), and provided an example of Vg1-sfGFP/Sqt-RFP diffuse co-localization (Figure 4E). We agree with reviewer 2 that our embryonic model is intuitive and doesn’t necessarily require a mathematical model to make the point. However, after speaking with a number of colleagues, we found that the idea was not intuitive to everyone, so we decided to present a simple mathematical model. […] 1) Do the indel vg1 mutations lead to reduction of maternal vg1 message? in situ hybridizations indicate that the maternal message is not visibly reduced in the mutant embryos, but injection of the mRNA containing the 8 bp deletion found in the mutant fish does not rescue the phenotype. This data is now included in Figure 1C. 2) Are zygotic vg1 mutant truly aphenotypic? What about LR symmetry? We thank the reviewer for raising this point. We have included data that southpaw expression and heart positioning in zygotic vg1 mutants appears largely normal, suggesting that zygotic vg1 is not absolutely required for left-right asymmetry (Figure 1—figure supplement 2). We thank the reviewer for raising this point. We have tested up to 200 pg of vg1-NC mRNA, and find it does not rescue the phenotype (now indicated in the text). We thank the reviewer for her careful analysis of the immunoblots. 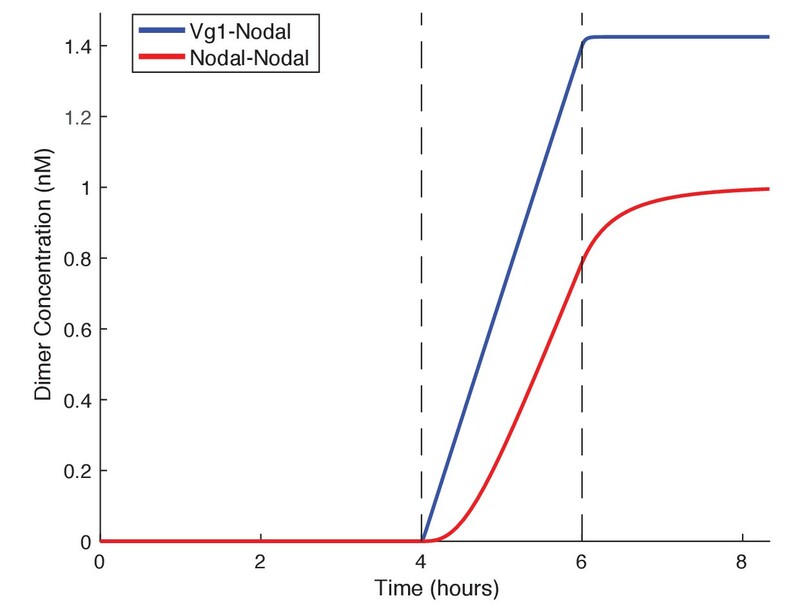 We agree that loading controls are necessary to draw quantitative conclusions about western blots, however, in this figure we only conclude that Vg1 is cleaved in the presence of Nodal, whereas Vg1-NC is not. The band corresponding to full-length Vg1/Vg1-NC provides an indication of the amount of Vg1 protein in each lane. We therefore don’t believe that a loading control is necessary in this case. We thank the reviewer for this comment. In lieu of membraneRFP, we used Vg1-pHluorin in Figure 4 to verify that the Vg1 puncta we see in the presence of Nodal are extracellular. Moreover, the Nodal localization patterns have been previously published and validated (Muller et al. Science2012). The RNA doses are stated in the figure legend: 50 pg for each mRNA. We agree that there is variability in the extent of extracellular localization of Vg1 across individual embryos, which follows a general observation that mRNAs injected at the 1-cell stage are not uniformly inherited into subsequent cells. In order to address whether the extent of Vg1 secretion depends on the amount of Nodal, we co-expressed vg1-sfGFP with different levels of cyc and sqt and found that extracellular Vg1 is reduced when Nodallevels are lowered (see Figure 4—figure supplement 1A). In addition, we have expressed vg1-sfGFP at the 1-cell stage and injected 1 cell out of 16 at the 16-cell stage with cyc-RFP. Only the cells that inherit Cyc-RFP secrete Vg1-sfGFP (Figure 4D). We thank the reviewer for bringing this to our attention. We have clarified the text, and included an additional co-IP with Vg1-HA and Cyc-/Sqt-Flag. We find that full-length Cyc protein readily co-precipitates with Vg1, but the mature Cyc protein is less easily detected than mature Sqt. We thank the reviewer for raising this interesting topic. Please see point 2 above. We thank the reviewer for raising this interesting point. Since Vg1 and Nodal are expressed in both the YSL and embryonic margin, it is likely that Vg1-Nodal heterodimers normally form in both locations. The reviewer is correct to point out, however, that the YSL-mediated rescue suggests that the formation of heterodimers in the YSL alone might be sufficient for patterning, and supports the view that Nodal signaling can be propagated through diffusion, thus undermining some of the claims in (van Boxtel et al. Dev. Cell 2015). Since the rescue is not fully penetrant, we are currently performing complementary experiments to directly test different models of Nodal propagation and will report these results in a separate study. The authors would like to thank Nate Lord, Jeff Farrell and Constance Richter for helpful comments on the manuscript, Nate Lord for modeling, Toby Montague for graphics advice, Fred Rubino for immunoblot advice and Andrea Pauli for mentorship. We thank Rebecca Burdine and Joe Yost for collegial interactions and for coordinating publications. The BMP7a-Flag construct was a gift of Mary Mullins. This project was supported by NIH GM056211 (AFS) and a National Defense Science and Engineering Graduate (NDSEG) Fellowship (TGM). Animal experimentation: All vertebrate animal work was performed at the facilities of Harvard University, Faculty of Arts & Sciences (HU/FAS). The HU/FAS animal care and use program maintains full AAALAC accreditation, is assured with OLAW (A3593-01), and is currently registered with the USDA. This study was approved by the Harvard University/Faculty of Arts & Sciences Standing Committee on the Use of Animals in Research & Teaching under Protocol No. 25-08. © 2017, Montague et al. Zebrafish Gdf3 (Dvr1) is a member of the TGFβ superfamily of cell signaling ligands that includes Xenopus Vg1 and mammalian Gdf1/3. Surprisingly, engineered homozygous mutants in zebrafish have no apparent phenotype. 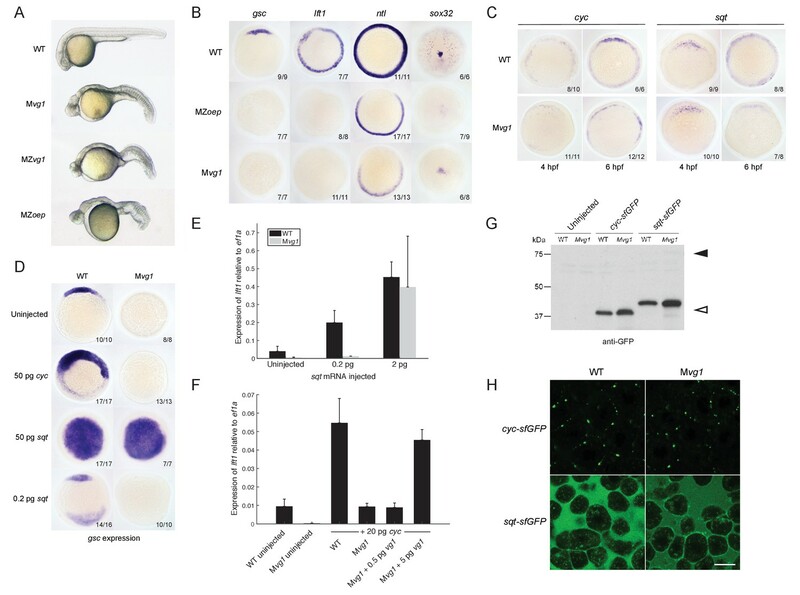 Elimination of Gdf3 in oocytes of maternal-zygotic mutants results in embryonic lethality that can be fully rescued with gdf3 RNA, demonstrating that Gdf3 is required only early in development, beyond which mutants are viable and fertile. Gdf3 mutants are refractory to Nodal ligands and Nodal repressor Lefty1. Signaling driven by TGFβ ligand Activin and constitutively active receptors Alk4 and Alk2 remain intact in gdf3 mutants, indicating that Gdf3 functions at the same pathway step as Nodal. Targeting gdf3 and ndr2 RNA to specific lineages indicates that exogenous gdf3 is able to fully rescue mutants only when co-expressed with endogenous Nodal. Together, these findings demonstrate that Gdf3 is an essential cofactor of Nodal signaling during establishment of the embryonic axis. Vertebrate embryonic patterning depends on signaling from Nodal, a TGFβ superfamily member. There are three Nodal orthologs in zebrafish; southpaw directs left-right asymmetries, while squint and cyclops function earlier to pattern mesendoderm. TGFβ member Vg1 is implicated in mesoderm formation but the role of the zebrafish ortholog, Growth differentiation factor 3 (Gdf3), has not been fully explored. We show that zygotic expression of gdf3 is dispensable for embryonic development, while maternally deposited gdf3 is required for mesendoderm formation and dorsal-ventral patterning. We further show that Gdf3 can affect left-right patterning at multiple stages, including proper development of regional cell morphology in Kupffer’s vesicle and the establishment of southpaw expression in the lateral plate mesoderm. Collectively, our data indicate that gdf3 is critical for robust Nodal signaling at multiple stages in zebrafish embryonic development.